"suno to zara hum ko hai ye kehna waqt hai kya tum ko pata hai naso gayi... wake up sid saare pal kahe wake up sid chal kahin chale..."
Finally I have stopped the snoozing with half-eyes open.. Yep.. My alarm keeps on buzzing aside from 5.25 a.m. Its almost 6.55 a.m. now. Asusual my plan of going for an early jog has been dropped. "Its time to wake up Guru" I said to myself and after a brush landed again on the bed with the paper . Awaiting the most zealous moment of my day. Yep.. Sipping the coffee made by my mom. No words to describe it. She did and it has arrived it to my palm and the chanting "Haree venkatesa praseetha praseetha, priyam venkatesa prayaccha prayaccha...." got dimmed as she has reached the kitchen. The only time when my heart feels so fresh in a day. Dad dropped me in the East tambaram bus stand and left back. T or C? this is what I used to look for. Yep. 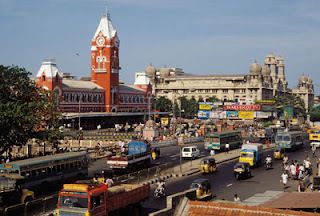 T51 and C51 are the two mobile metal boxes which would carry me till Sholinganallur where my work place is located. Sorry suppose to say chennai MTC buses. Thanks to MTC to keep a single seat in driver's row at the corner where I love to sit and sometimes you would feel like driving that huge eight wheeler. That is how I convince myself, but the actual reason behind is that usually you cant find any pulling chicks inside my bus. So better to sit here itself with no hard feelings. I really dont have clue that how do those dainties residing in my place travel? Or atleast where do they go? That day too I have got into the same place in a C51 bus. Suddenly I got a pat and heard a voice "hello sir! nethu office ku leave polarku?" (did'nt go to office yeaterday? ) some one asked me from the back and sat aside me in the specialized seating of the vehicle! "Hi ! Illa, nethu naa office ku seekrama kalambittaen. saptacha Ramesh? ena special iniku?" I asked him. (Nope. I have started earlier yesterday. Had break fast? anything special?) Yep. He is the driver of that C51 and of course has become my friend in the recent days by being seated nearby daily. He has pushed on the gas and the bus has started moving. Sharply 8.45 a.m.I have played "Ho love of mine..with a song and a whine..You’re harsh and divine..like truths and a lie..but the tale end is not here....... Tune mere jaana.. Kabhi nahi jana.. Ishq mera dard mera.. haaye… " in my Yari (mobile). Recent intense romantic track written by an IITian about the misery of his true love which has simply touched my soul. Eerie silence has followed. Yep..Guru has fallen asleep in deep. "Sholinganallur!! Nallur.. Nallur.." Some one knocked and cracked my dream of rescuing Anushka Sharma from slipping down when we were walking towards the Victoria Falls located on the Zambezi River between the countries of Zambia and Zimbavae shown by Bear Grylls last night in Man Vs Wild which is really a lovely place to hang out. The shouter was none other than the conductor of the vehicle who wanted the people with their dreams and creams to get down and we did it. Its 9.20 a.m. and I have got down, walked towards my office but alone this time. The person whom I have rescued from a deadly deep has left without even saying a formal thanks :( Life is crazy yaar!! "O Ondru Kulla Ondra, En Nenjikulla NindraO Konjam Konjam Aagha, Uyir Pichi Pichi ThindraAva Oththa Wartha Sonna, Athu Minnum Minnum PonnaO Enna Solli Enna, Ava Makki Poana "
Sounds like a situation track eh? Yep. Even I thought the same. So have stopped the media player, kept my mobile inside and continued walking. And its sharply 9.30 a.m., I have entered my ODC (Offshore Development Center) and Wished "Good morning" to people over there and specially to Ganeshji (my picturised calender on my table) and smiled at my momento quoted "YOUR CHOICES REFLECT YOUR CHARECTER" given in my project and switched on my PC with no reactions on face. After checking some useless corporate mails and funny ones from friends, started working on CCMIP (the module I am responsible for). I was doing Unit testing for that module which has been ported by our team. I don't wanna get into too much technical on my work:) Simply I have started my work for the day. Its 10.45 a.m. In a while, "Hi Guru! How is it going?"! Someone asked me from my back. It was not actually a someone! My Manager Sri..
"How is it going?" It is a template question he asks everyone working over here four times a day. Whenever he asks this, you can tell him like, "I had a huge fight with my girl friend last night and we have decided to get broken up!" or "This weekend I am planning to go to Rio with my friends in PVR cinemas" or "tomorrow is friday" or bla bla bla... he he :) I mean What ever you say, he wont bother. He feels like his job is to ask you and not to listen to you.. I said him something like that and he left after listening. Its 10.55 a.m. "Hi Guys!! Are you people gone dumb? come on! say and laugh some thing to reveal that you are alive..dont fall into the computer monitor and break Wipro property.." some funny voice entered and its none other than Uma Shankar who is actually responsible to keep our ODC lively and active whenever people are dragging with those million lines of code. Thanks to him for being the source of fun over there. Great work man! Amidst fun and work, again I would get the same template question but this time in his cubicle. After telling bla bla bla, I would keep on working on it..
Its 1.12 p.m. "Lady looking like ah Cinderella Cinderella, nooding lokking like thendrella.Lady looking like ah Cinderella Cinderella, ennai vattamidum thendralla"
"Machi Shall we?? Come to junction in sharply 5 min. Today I will have your lunch box and you should eat nellore meals.. okay va?" "Jaldi aavo Naveen and pls don't make late" I told him and started to walk towards junction point. Since he was very poor in hindi and ofcourse tamil too.. I am teaching him at all instances where I do get chances ! So, with the hope that he would be grammatically good in both dictions atleast in the offing. Junction point- a place where we people meet up and from where we used to walk towards cafeteria together. Asusual, I went there late and two fellows were waiting for me with reddy faces! One was obviously naveen and I have to mention something about the second one before I disclose his name. This is fellow used to come to cafe with us as if he has just now arrived from the airport and kept his huge trolly in his place and coming with us just to eat. 1.25 p.m. We three mushketeers walked towards cafeteria as if we were gonna achieve something! Partially "YES" for those two..
Crowdy and noisy dining has appeared in front in the second floor and it is named "Ratna cafe" here. They both used to say that they prefer Ratna cafe for its taste. But its ultimately waste in its taste but something is behind this saying. After entering I have found a cracky smile on both of their faces. Yes their achievement has been done asusual! They met Miss.Sharadha! Our college fairy (so called,but 'm not interested).. They used to feel like, last evening they had a meet up with her and all of them took a mutual break up and gonna be friends here after.. Yep.. Imagining themselves as Vineeth and Abbas :) he he :)Finally they came out of the long queue and got their meals and we three sat together in a table. In a while, three more devils have departed to our table. One among was Kango. she is famous for her traditional punches.. And everyone has to be careful while getting a pay back from her for our words ;) "Punch Kango!!!" And the next was Raji.. Whenever we all of us sit and eat together in a table, people from outside used to think that we are having lunch with a chinese client or with a girl from northeast..That is how she looks.. Like a chinese girl. But the truth behind is that she is actually from a deep southern village of tamilnadu but looks so. Ofcourse, a perfect village kind of girl. All these people before seeing there own plates would start looking at my SMALL lunch boxes to get openend. Mainly their eye balls used to roll towards my side dish box.. Unfortunately (may be fortunately) I brought "Bindi" (Lady's finger) that day and it was found by them before I came to know..
Shiva has filled up the table with his traditional PJs :) Food and fun in the same table we had:) Only time in office you would forget about the stress, pressure or whatsoever you have in the cubicle is when you have lunch with your pals..
Its 2.15 p.m. We were done with what for we have come here and started walking back to our respective ODCs on a merciless sunny summer noon. Its 2.25 p.m.I have entered mine and walked towards my PC..
"Yep! your pen has worked something out and made my score 58 :(:( Tons of thanks for your greatest favour! keep your pen safe.." I replied him back.. He is such a funny fellow and belongs to that kind of "Sachinism" community whom even wont bother a call for date from his girl friend, if sachin is padded live on the field. You know what is the hardest thing in the world? Working after Lunch! God save us please! Its 3.55 p.m. Its time for Sri and he did his job again and I have paid him back with something which did not bother asusual..
Its 4.45 p.m."Lady looking like ah Cinderella Cinderella, nooding lokking like thendrella.Lady looking like ah Cinderella Cinderella, ennai vattamidum thendralla"
My mom/dad/sister or some old friends accidentally call and at max I used to get hardly two to three calls a day. Rest of the calls and messages would be from Airtel Customer care.. I am lazy enough to activate that "Do not disturb from my mobile" So, these people used to think that I am speaking and texting my girl friend often. And even if I say "NO", they would not bother and keep on teasing me.. OMG! Save Guru please! After having it we went to cafeteria and ordered two chayas to our odiya chaya maker to whom I used to blabber something in broken hindi and he would reply me back something which I don't even get anything. We did the same thing that day too.. He gave us two cups of hot tea with superlative taste and we had it by watching highlights of England Vs Netherland WC cricket match. I told him like today I made some four test cases "PASS" Sri.. He felt like hugging me and threw a childish smile towards me as if he has got a call from his ex-girlfriend to whom he has broken up in college days. And after updating everything I came back to my place and said bye for the day to those who were statying over there..
Its 7.35 p.m. I have left for the day and walked towards the Sholinganalur bus stop and reached the place. This time I could not even get a place to be seated in a MTC bus. I have found dozens of people travelling in just last step of the bus as if they were flying on wheels. Even If I were the only fellow to stand in a bus too, I wont prefer to travel in it. And it is the worst case now! How could I?In fact,I was lazy and tired too. So obviously dropped my plan of opting for a MTC carrier asusual. Its 7.45. p.m."Tambrein..Tambrein..Tambrein" one fellow was shouting near me and ofcourse he has found out that I am gonna opt for his vehicle only, from my face as if it has been written on my forehead. I did as he thought and got into it. The vehicle is so called Share Auto (an expanded auto like vehicle which carries various people on its way and drop them in their respective places). By sitting in it, I have seen people crossing me in bikes and laughed at them. Its 8.15 p.m. now. "Stop it in the left anna..I have to get down" I told the driver and got down in my stop and walked towards my home along with those downy people in my street who were also seemed that they were back from work. And my dad was standing near the gate and asked me "Why dear? this much late today?" as if I am coming earlier everyday ;) "Had some work bapa.. Thats y :( "..Had a chat with him outside for sometime and got into home..
Its 8.45 p.m."Good performance Santhosh! Amazing.. Work on your lower notes and it would be even better next time.. All the best!!" Unni krishnan (Classical singer) was praising the contestant Santhosh in Airtel Super Singer Season 3 which was telecasted on the Television. (A good Music show which we all used to watch everyday).. Mom was watching and I was teasing her for fun for a while and went in to take my bath.. When I was back, it was Rottis and Dhal on the dining and I had it before changing into my night attire:) Had a cup of milk too..
Then was watching TV for some more time and Its 9.30 p.m. now..Took my lap and checked all the likes,friend requests of those old friends and funny updates to my pics and comments on FB for sometime.. Chatting with those overseas buddies and its 10.20 p.m. now..Mom and Dad were almost slept. My eye lids were meeting up persistently and reminding me that its time to sign off for the day.. So I have sighned off from FB too and walked towards my bed..
And noticed the date on the calender on my way that it was 22nd March 2011..The same day last year I have stepped out of my home to start my career journey in my life. And I could'nt believe that Its one year since then today! Yep I used to note the date only at nights before I sign off for the day.. "You are getting older guru!" I tapped myself and walked again..I was finally down for the day!! This is all about the things that happen in a week day of My Life at Chennai! !